By Rob Ervin and David Diyle. The iconic American tank of World War II, the M4 Sherman was known for its simple, reliable, and flexible design. Ten different companies contributed to the total output of 50,000 units produced in a myriad of variations. Even after it went into serial production in 1942 the Sherman was subject to almost constant change and modification, based on lessons learned and needs perceived on the battlefield. 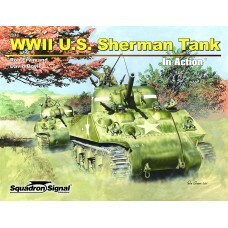 The full story of the Sherman's exploits would fill several volumes, so this book focuses on the variants and sub-variants of the Shermans used by US forces during WWII. 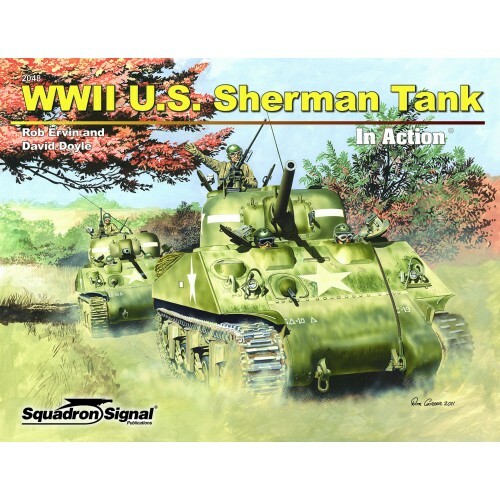 The Shermans that rolled off the assembly lines in 1945 bore little resemblance to the M4s produced in 1942, and this volume chronicles each major model of the Sherman everywhere the American soldier fought. Augmenting the nearly 200 period photos, many of them in rare original color, are a host of exquisitely rendered line drawings illustrating the subtle variations in hull, turret, and weapons used on these famed armored fighting vehicles. Includes color profiles. 80 pages.